Motorized Window Treatments in Tampa – Motorized shades and blinds, motorized stage curtains and AV systems for commercial and high-end residential. Recent advances in technology have allowed us to expand our services to include the installation and maintenance of various motorized systems for commercial and high-end residential clientele. Once available only to those with very large budgets for their window treatments, motorized blinds and shades are now more affordable and customization is much easier. 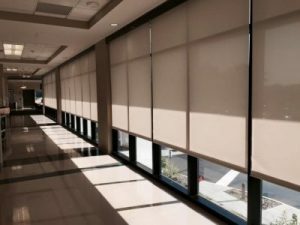 From restaurants and hotels, to apartments and office buildings, to auto dealers, to retail and more, we customize each order with motorized solar shades and blinds. There are several reasons to choose a motorized window covering system over a hand-operated system. First, a motorized system makes it easier to adjust the position of your blinds and shades. This added convenience greatly simplifies the control of light and temperature in your commercial or office space, especially if you have blinds or shades that are located in hard-to-reach places, or are too tall or simply too large to easily manipulate by hand. A motorized system also helps you control light and temperature by making it easy to precisely control and coordinate the position of all of the shades or blinds. In addition, you can program motorized window coverings to open or close automatically at specific times of day. In turn, this gives you the ability to conveniently protect your furnishings, flooring and other valued property from penetrating, harmful UV radiation. 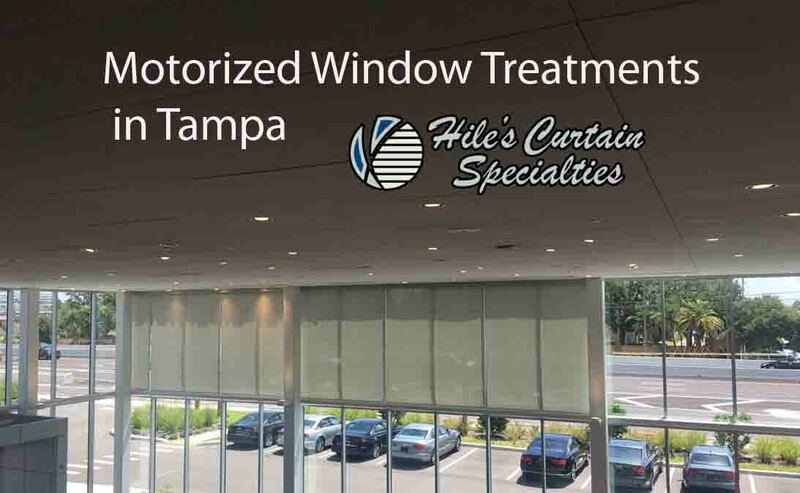 As the premiere source of the finest in window coverings in the Tampa area, Hile’s Curtain Specialties is devoted to giving every client excellent service and superior products. We work with Florida’s leading architects, interior designers and building contractors providing them with the latest information and motorized window covering products. Each project challenge is unique and no detail can be overlooked or underestimated. We specialize in state of the art motorized systems for stage curtains, window treatments, and projection screens. 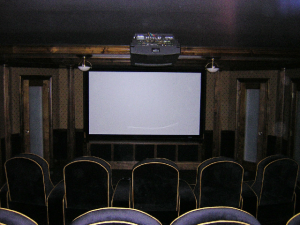 From Corporate Media Rooms to Home Theater – Hile’s is your first choice. For Over 45 Years Hile’s Curtain Specialties has been the leading provider of Commercial Window Coverings in Tampa Bay Florida.